CORVALLIS, Ore. — Gonzaga has pulled off an NCAA tournament upset at Gill Coliseum before, stunning home team Oregon State back in 2015. Oregon State coach Scott Rueck already is wary of the Zags this season, having seen them at a tournament in Vancouver, B.C., earlier this season. As the 11th seed back in 2015, Gonzaga beat sixth-seeded George Washington before facing the No. 3 Beavers. The Bulldogs pulled off a 76-64 upset of Oregon State in Gill Coliseum to advance to the Sweet 16, which was in Spokane. The run ended there with a defeat against Tennessee. Saturday, fifth-seeded Gonzaga (29-4) downed No. 12-seed Little Rock 68-51 in the opening round at Gill. Katie Campbell had 15 points, hitting five three-pointers while Zykera Rice added 18 points and six rebounds. The Zags, ranked No. 16 in The Associated Press’ final Top 25 poll of the season, led by as many as 21 points in the first half and cruised to the victory. Gonzaga is making its 11th NCAA tournament appearance, and third in a row. The Bulldogs’ best finish was an Elite Eight appearance in 2011. They’ve made the round of 16 four times. Fourth-seeded Oregon State’s first-round game against No. 13 Boise State didn’t go so smoothly. The Beavers (25-7) eked out an 80-75 overtime victory, led by Mikayla Pivec with 20 points and 12 rebounds. Aleah Goodman added 20 points. It was Oregon State’s sixth consecutive visit to the NCAA tournament. The Beavers have been to the Sweet 16 for three consecutive seasons, including a run to the Final Four in 2016. 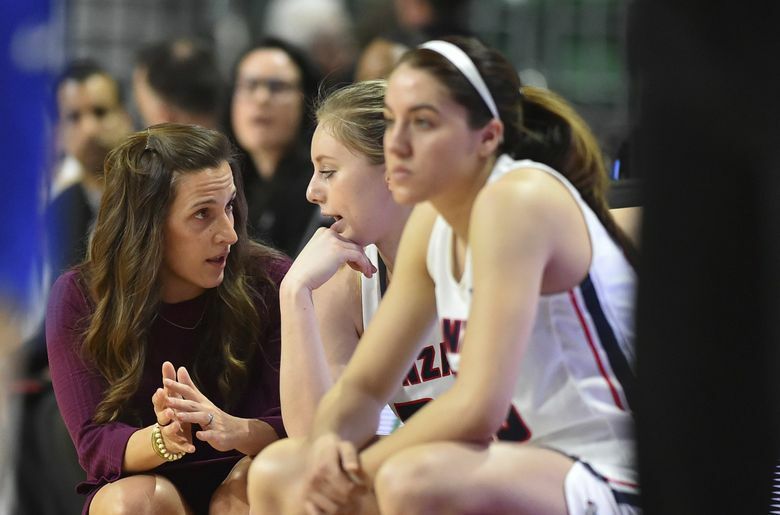 Stockton, the daughter of Gonzaga great John Stockton, was on the bench in street clothes for the NCAA opener Saturday, a brace on her left leg. Jessie Loera started at point guard for Stockton against the Trojans. Townsend also was there, on crutches. She surprised her teammates by greeting the bus when the team rolled up to Gill Coliseum and she was waiting. Fortier left Gonzaga’s bench in the final quarter of the team’s defeat against Brigham Young in the WCC championship game to be by his side in the hospital.